Lincoln Center Theater's revival of Lerner & Loewe's classic My Fair Lady is nominated for 10 Tony Awards this year including Best Revival and Best Costume Design of a Musical for Catherine Zuber and her remarkable work. While enjoying this acclaimed revival, your eye will naturally gravitate to standout Christine Cornish Smith (who made her memorable debut last season as the fierce Bombalurina in Cats)—you can't miss her at the Ascot races. 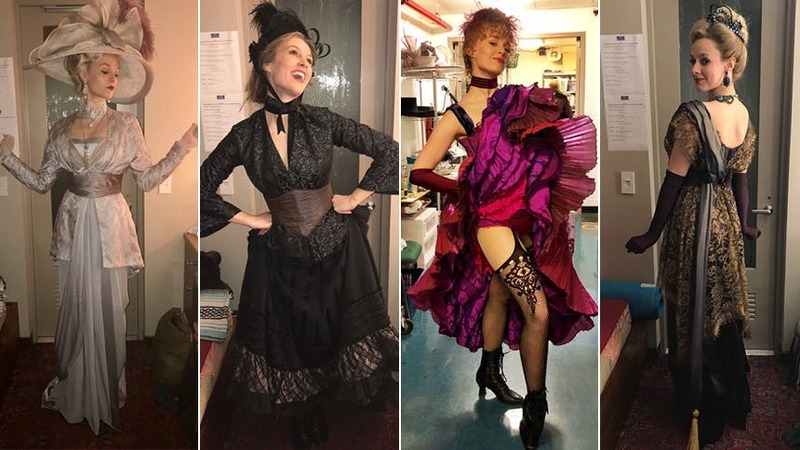 BroadwayBox asked Christine to share with us all her lush My Fair Lady costumes, and her descriptions are just as rich and perfect as the Zuber gowns. Scroll on to journey through 1913 London with Christine Cornish Smith. One of my favorite aspects of being in My Fair Lady is definitely the COSTUMES! Our genius designer, Catherine Zuber, has created pieces that are historically accurate, while still feeling new, alive, and quite glamorous! Take a look, y’all! My first look is a cockney flower girl in Covent Garden, who I have lovingly named Nancy Peacock. (Nan for short). I have 2 layers of (rather heavy) skirt on, complete with a custom made top, belt, and cloak. Cathy Zuber is SO good about staying true to the time, from the fabric choice to the length and feel of a dress or skirt. It definitely helps as an actor to have on the weighted and true material that a girl in my position would have worn in 1912 London. Fun fact!! There were no public restrooms for women in this time! (What?!) So, if you were out and about and had to go………. WHAT?! Things ya DON’T think about, am I right?? Next is my daytime cockney girl look. I wear this for “A Little Bit of Luck”! Ok, so let’s be real here….this TOP is my favorite and I want to steal it for my real life to wear it with a pair of jeans. (Don’t tell anyone) OK back to the costume…. This saucy girl has on, again, 2 layers of skirt and an apron, some mid length brown lace up boots, that PERFECT top, and a classic Edwardian Era hat that I just love! I always feel so flirty in this costume because not only does it fit like a glove, but it is easy to move in as well. Now…we have ASCOT! Let’s go to the horse races! This whole scene is visually STUNNING. Everyone is in a subtle lavender tone, with very pale makeup and blonde wigs, complete with faces that are…to say the least…not enthused. When everyone is onstage in these looks, it is a sight to see! Cathy did such a beautiful job of adding texture and detail to each and every costume, which are all unique in their own ways. I am not going to lie…I am pretty sure I have the largest hat in the cast for this scene. Perhaps a family of ostriches live atop my head? PERHAPS! Complete with jewels to die for and our custom lavender or white LaDuca boots, this is definitely the fanciest I have felt onstage in a long while! At intermission, I transform into the Embassy Ball look. I love how these costumes start to foreshadow the 1920s trends with the empire waist and a more straight up and down silhouette. These costumes were tricky to get the swing of things, because we are doing the Viennese waltz in this dance sequence…complete with spins and twirls with our partner. So, we have finger loops to keep out skirts off the ground. This definitely took some rehearsal with our partners to negotiate where exactly the dress falls, but after much preparation, this scene is one of my favorite scenes to dance! Wearing this costume somehow makes me stand taller, which is something I am grateful to feel! I then go back into my Covent Garden look, sans cloak. I love that I get to show off this beautiful top even if it is just for the brief “Wouldn’t it Be Loverly” reprise! NAN PEACOCK makes a comeback! Thanks for taking a look at all my LEWKS, y’all! It takes a village to make us look the way we do…multiple talented dressers, lightning-fast wig and hair crew, constant alterations and adjustments done during the day, hard-working talents making sure we have clean clothes for each and every show—it’s truly amazing to see it all come together each night! Don't miss the incredible Christine Cornish Smith in 'My Fair Lady' at Lincoln Center Theater's Vivian Beaumont Theatre.